Text of the U.S. Constitution as ratified by the Constitutional Convention on Sept. 17, 1787, established the government of the United States. 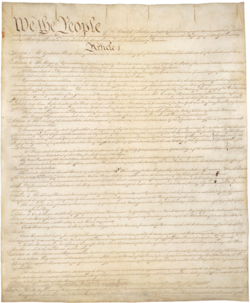 The United States Constitution is the founding document of the United States of America as well as the supreme law of the land, which was adopted on September 17, 1787 in Philadelphia, Pennsylvania. Generally speaking, it is an attempt to form a comprehensive foundation of governing and political principals of the federal governments limitation and scope the United States is to live up to. See text of U.S. Constitution. The first three articles (Articles I, II and III) establish the three branches of government. Article I is the Legislative branch, which consists of the state Legislatures, the Senate and House of Representatives, the latter two makeup the national Congress. Article II is the Executive branch, or the office of the President. Article III deals with the Judicial court system. Article IV defines states rights as well as citizen rights within those states like no other country before, and admittance of new states into the Union is specifically allowed. Article VI states responsibility of past oaths and debts are to be honored, and has the rather famous saying that, "no religious Test shall ever be required as a Qualification," to an individual for an office within the government. Article VII then deals with the ratification of the United States Constitution as a binding legal document through the, "Conventions of nine States." 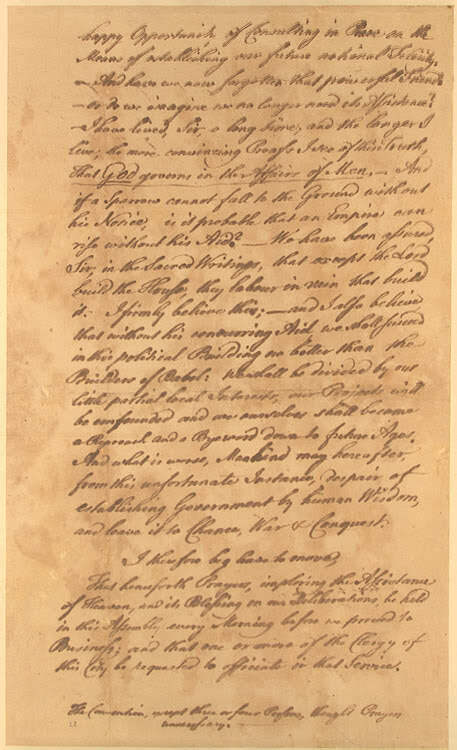 At the 1787 Constitutional Convention Benjamin Franklin delivered a famous speech, asking that the Convention begin each day's session with prayers, at a particularly contentious period, when it appeared that the Convention might break up over its failure to resolve the dispute between the large and small states over representation in the new government. The eighty one year old Franklin asserted that "the longer I live, the more convincing proofs I see of this Truth--that God governs in the Affairs of Men". "I also believe", Franklin continued, that "without his concurring Aid, we shall succeed in this political Building no better than the Builders of Babel". Franklin's motion failed, ostensibly because the Convention had no funds to pay local clergymen to act as chaplains. When the Constitution was submitted to the American public, "many pious people" complained that the document had slighted God, for it contained "no recognition of his mercies to us . . . or even of his existence." The Constitution was reticent about religion for two reasons: first, many delegates were committed federalists, who believed that the power to legislate on religion, if it existed at all, lay within the domain of the state, not the national, governments; second, the delegates believed that it would be a tactical mistake to introduce such a politically controversial issue as religion into the Constitution. The only "religious clause" in the document--the proscription of religious tests as qualifications for federal office in Article Six--was intended to defuse controversy by disarming potential critics who might claim religious discrimination in eligibility for public office. That religion was not otherwise addressed in the Constitution did not make it an "irreligious" document any more than the Articles of Confederation was an "irreligious" document. The Constitution dealt with the church precisely as the Articles had, thereby maintaining, at the national level, the religious status quo. In neither document did the people yield any explicit power to act in the field of religion. But the absence of expressed powers did not prevent either the Continental-Confederation Congress or the Congress under the Constitution from sponsoring a program to support general, nonsectarian religion. The well-known authors are Alexander Hamilton, James Madison and John Jay. An amendment consists of clauses and when applied modifies or adds to the Constitution. There are two specific ways to approach the amendment process. In its earliest form it is a bill needing to be passed by both houses of the legislature, from there it is to go on to the states legislatures. Because of the long-standing process of ratification by these state legislatures, and nearly 10,000 submitted Constitutional amendments since 1789, a seven year time limit is usually in effect. The second way to initiate the process for an amendment is to call a Constitutional Convention. This decision is put forth by a call from at least two-thirds of states legislatures. A convention is convened that will then be the voice to propose a new amendment to the United States Constitution. The Bill of Rights, as ratified by Congress on September 28, 1789. The Constitution did not originally contain a Bill of Rights that would explicitly enumerate the rights of American citizens and enable courts and public opinion to protect these rights from an oppressive government. Supporters of a bill of rights permitted the Constitution to be adopted with the understanding that the first Congress under the new government would attempt to add a bill of rights. James Madison took the lead in steering such a bill through the First Federal Congress, which convened in the spring of 1789. The Virginia Ratifying Convention approved the Constitution with the understanding that the state's representatives in the First Federal Congress would try to procure amendments that the Convention recommended. Among them were large numbers of Baptists who wanted freedom of religion secured. The twentieth proposed amendment deals with religion; it is an adaptation of the final article in the Virginia Declaration of Rights of 1776 with this additional phrase: "that no particular religious sect or society ought to be favored or established by Law in preference to others". During Madison's speech introducing the Bill of Rights into the First Congress on June 8, 1789, he proposed an amendment to relieve the anxieties of those who feared that religious freedom would be endangered by the unamended Constitution. 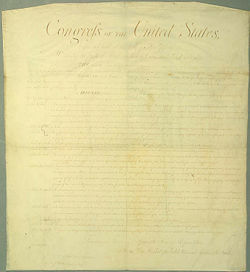 According to The Congressional Register Madison, on June 8, moved that "the civil rights of none shall be abridged on account of religious belief or worship, nor shall any national religion be established, nor shall the full and equal rights of conscience be in any manner, or on any pretext infringed". In the notes for his speech, Madison indicated his opposition to a "national" religion. Most Americans agreed that the federal government must not pick out one religion and give it exclusive financial and legal support. On September 28, 1789, both houses of Congress voted to send twelve amendments to the states. In December 1791, those ratified by the requisite three fourths of the states became the first ten amendments to the Constitution. Religion was addressed in the First Amendment in the following familiar words: "Congress shall make no law respecting an establishment of religion, or prohibiting the free exercise thereof". The dominant way to interpret the Constitution is called originalist, retaining many of the same qualities as a biblical exegesis. Within contemporary conservative thought the judicial branch of the United States government has strayed significantly from core originalist interpretive principles. Especially within the last century judges have assumed superiority of their contemporary contexts, another biblical interpretive approach that critics often use. It is called eisegesis and when applied to that of the United States Constitution it manifests revisionism and judicial activism which is considered legislating (forming law) from the bench. There are essential governing principles to apply when trying to ascertain the fundamental original meaning of specific clauses within the Constitution. Specific guiding statements expounded on by The Heritage Foundation aid in the study, interpretation and ultimately application of the United States Constitution. The definitions according to the dictionary at the time. Using the immediate context of other parts of the Constitution. Deduce meaning from the words to attain a language. Glean more understanding by comparing against the debates held within the Constitutional Convention. Understand the historical provenance of the legality of the words. The words in their historical context of economy, social, and political backgrounds. Words in the context of the revolutionary period. Understand the language in the context of the political philosophy of the Founding generation. Historical, religious and philosophical authority put forth by the Framers. Commentary in the ratification debates. How the Constitution was applied by the three branches of the government during the Founding generation. Evidence of long standing traditions that help define the peoples understanding of specific parts of the Constitution. ↑ 4.0 4.1 4.2 4.3 4.4 4.5 4.6 Religion and the Federal Government:Religion and the Founding of the American Republic. U.S. Library of Congress. Civil Rights Division; Voting Section; Voting Rights Act Clarification by U.S. Department of Justice, posted April 2, 1998. This page was last modified on 29 April 2012, at 11:45.